**Currently we only offer our silicone hoses in black. Hoses are shown in blue for photographic reasons only. Evolution MotorSports V-Flow air inductions systems are computer designed specifically for each individual application to give your engine maximum airflow, which means more horsepower, torque and improved performance. 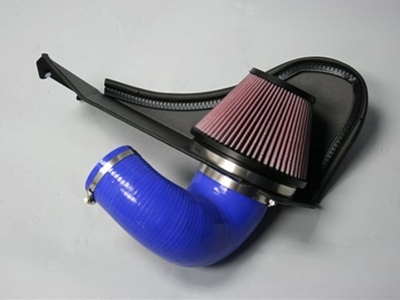 All V-Flow air intake systes have been dyno tested and tuned to provide maximum performance and efficiency. 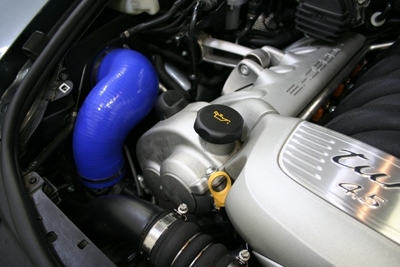 By utilizing computer-aided design, EVOMS engineers produced the Cayenne Turbo air intake system to provide an unmatched fit, finish and superior air filtration. 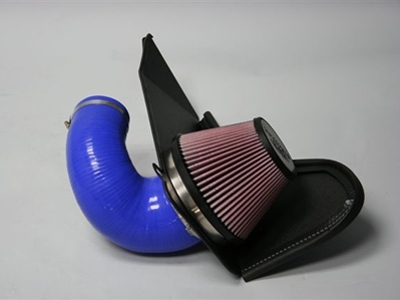 This intake system utilizes our exclusive 100% oil-free "Synthamax" air filter technology. Our fully synthetic filter technology provides optimized flow with unmatched filtering properties which equals maximum power and protection. *As tested on a 2005 Cayenne TT using a DriftBox by Racelogic satellite performance data acquisition system. An average of 5 runs were done for each test. The high and low figures were discarded and the 3 remaining tests were averaged to determine times.